Turkish textbooks have taught children how treacherous Arab tribes stabbed their Ottoman ancestors in the back during the First World War, and even how Arabs collaborated with non-Muslim Western powers against Muslim Ottoman Turks. A pro-Western, secular rule in the modern Turkish state in the 20thcentury coupled with various flavors of Islamism in the Arab world added to an already ingrained anti-Arabism in the Turkish psyche. Erdogan does not understand that Arabs do not wish to revisit their Ottoman colonial past. 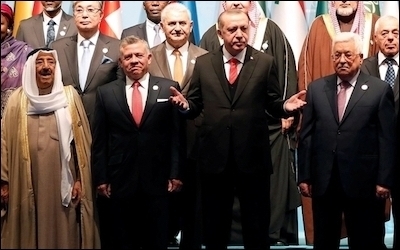 Turkey hosted a high-profile summit of Arab-Islamic leaders in December 2017 to condemn U.S. recognition of Jerusalem as Israel's capital. The front row, from left to right: Emir Sabah of Kuwait, King Abdullah of Jordan, Erdogan, and Mahmoud Abbas of the Palestinian Authority. His spokesman, Ibrahim Kalin, happily said that the dispute over Jerusalem after President Donald Trump's decision to move the U.S. embassy from Tel Aviv to the Israeli capital "had in fact united the Muslim world." 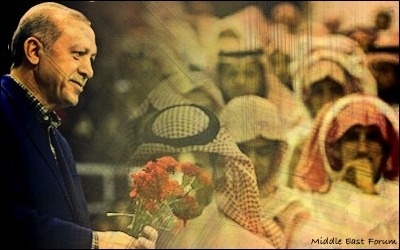 Erdogan was a rock star in the Arab world when he visited Jerusalem in 2005. No longer. Some impertinent man sinks low and goes as far as accusing our ancestors of thievery ... What spoiled this man? He was spoiled by oil, by the money he has. 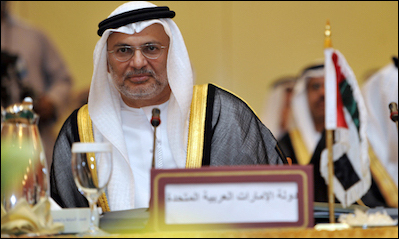 UAE Foreign Minister Anwar Gargash: The Arab world will "not be led by Turkey." Anwar Gargash, UAE's Minister of State for Foreign Affairs, said there was a need for Arab countries to rally around the "Arab axis" of Saudi Arabia and Egypt. Did Erdogan hear that? If not, he should have heard this one: Gargash also said that "the Arab world would not be led by Turkey." In what better plain diplomatic language could the idea have been expressed? Meanwhile Erdogan keeps living in his make-believe world. Last summer, as part of his futile "euphemizing Arab-Ottoman history" campaign, he claimed that "Arabs stabbed us in the back was a lie." Not even the Arabs claim they did not revolt against the Ottomans in alliance with Western powers.